Growing degree days provides a “heat” value for each day. The values added together can provide an estimate of the amount of growth plants have achieved. Some people use GDD’s to predict when plants will reach a certain growth stage. The developmental stage of most organisms has its own total heat requirement. I like to compare different years. Even though last spring was really wet to begin with, we had enough GGD’s to boost early growth and to make this year look a bit puny so far. We are somewhat behind, but I expect it to catch up soon. Fields that have had a lot of damage this winter from pugging may be damaged so badly they will not recover or be very productive. Even if not totally destroyed, they may have enough damage and open bare soil that weeds may be a major problem. Severely damaged fields, ones that have more than thirty percent bare soil showing, might indicate a good opportunity to totally start over with improved forages. But, evaluate them thoroughly, they might not be as damaged as they appear and fertilize if needed. 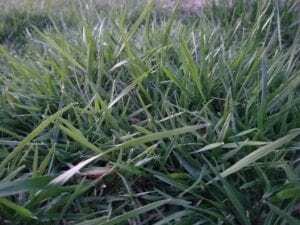 If starting over with new improved forages, you need to completely terminate all existing forage, especially if it has any anti-quality factors such as ergovaline in old Kentucky 31 tall fescue. Time helps, along with some good herbicides. Interseeding grasses into established grass stands just doesn’t work well. Established grasses will almost always out-compete seedling grasses. Seed, labor and time is too valuable to not succeed. First, the year prior to conversion, graze, clip or mow the field to prevent it from going to seed. This really helps to greatly reduce the KY31 seed bank. A spray-smother-spray method works very well. Graze the spring growth, then spray the stand with a non-selective herbicide, wait a week or two to let that forage die back and start to decay and then drill in a summer annual forage, such as sorghum-sudangrass, sudan grass, a millet, or a mix. This summer forage can later be grazed or, depending on what was planted, cut for hay. In August, spray the field a second time to make sure that there are no remaining perennial species and to kill any remaining summer annuals. When conditions are good, no-till drill the new improved species into the field. New fields will need adequate time to grow before being grazed. Ideally, if planted in the fall, grazing should be restricted until the next fall. Since you are investing a lot of money to get a new stand of forages, you will want to protect that investment, so you will want them to last. Most would not think about it, but even KY31 tall fescue takes time to fully establish as a solid stand, so have patience with your newly seeded stands. For technical assistance in choosing forages, seed varieties, rates for reseeding pastures, seeding methods, and fertility contact your local soil and water conservation district or extension office. For assistance in herbicide recommendations, consult your local extension office. I was recently at a good workshop on Novel tall fescues. In the late 90’s, the University of Georgia and Ag-Research in New Zealand isolated naturally occurring endophytes that produced alkaloids associated with good persistence, vigor and drought tolerance, but did not produce toxic ergot alkaloids associated with poor animal performance. The first MaxQ tall fescue releases were Jesup and GA 5. There are several available today. These endophyte-friendly tall fescues provide increased average daily gains, good yields and even persistence as good or better than even KY31. This is a huge improvement over low endophyte varieties that were not very persistent and were sometimes eventually taken back over by old KY31. If you are having issues with endophyte-infected tall fescue then switching may be worth the effort and expense. Symptoms for grazing animals include heat stress, rough summer coats, narrowing of blood vessels that can cause loss of hooves, tails, and ears, reduced intake and gain, low birth weights and poor reproduction rates. Research shows that switching from endophyte-infected fescue to Novel or other forages can potentially double the rate of gain on cattle. I really don’t know what some of the hills located in the fescue “belt” would look like today if they hadn’t been seeded to tall fescue back in the 40’s. It certainly has prevented a lot of soil erosion, but thank goodness there are better alternatives today that also protect soil while providing good, nutritious forage. It would be impractical to replace many fields of KY31 tall fescue at one time. Many producers are already stocked higher than they should and taking very many acres out of production for even one season is very hard to do. It is best and most practical to just try and convert a field or two at a time. As fields are added, concentrate first on using those, once established, for 30 days prior to breeding for improved pregnancy rates on cows. As more fields are added, start utilizing them for growing animals, improved gains, and improved milk production of lactating cows. It’s not always possible or practical to eliminate all the KY31 tall fescue on your land. If not, dilution is a fair to good defense, especially with red clover. High-density, short-duration grazing systems with sufficient rest periods help to promote diversity in monocultures of tall fescue. Limit the use of nitrogen fertilizers that will actually increase the ergovaline toxin in tall fescue and reduce clover at the same time. Nitrogen will boost grass yields, but it also feeds the toxic fungus. Avoid grazing close to the ground or the seed heads of KY31 tall fescue where the toxin generally concentrates. I’ll end this issue with a thought on magnesium. With temperatures fluctuating right now and new grass being utilized by livestock, it is easy to be short on magnesium when the animals consume lots of new “washy” green grass. It is a good idea to move to a high magnesium type mineral supplement (usually 10-20% instead of 1 or 2%) and continue with it until you are past the early flush of new forage. The issue with insufficient magnesium is more of a problem where nitrogen and/or potassium have been applied recently, or in excessive amounts. Grass tetany is the name of the disease where magnesium is deficient. For more detailed information about grass tetany, contact your local extension service or large animal veterinarian. Enjoy spring and keep on grazing! Posted by Smith at 5:11am March 29, 2019 Posted in Forages, Pasture. Bookmark the permalink.